Born Fernando de Bulhes in Lisbon, Portugal, he disappointed his noble family by rejecting his luxurious life and joining the Augustinian religious order. A scholar by nature, he read every book in the monastery, devoting his time to contemplative prayer. Eventually, he befriended a group of itinerant Franciscan monks and became fascinated with this new religious order. Much impressed by their dedication to simplicity, poverty and their belief in returning to the original words of Christ, he joined their ranks, changing his name to Anthony in honor of Saint Anthony of the Desert, the patron of their little church. Returning home from a failed missionary venture in Morocco, his ship was blown off course and he wound up in Messina, Sicily. A group of Franciscan friars insisted he go north with them for a great gathering of all Franciscans, with their founder Francis of Assisi. Anthony remained in Italy and discovered his great gift of preaching when a superior ordered him to speak at an ordination, telling him to say whatever the holy spirit had infused into him. He astonished his audience, not only by his skills as an orator but by the depth of his knowledge. He was sent throughout northern Italy and southern France on evangelical preaching missions which gathered crowds in the tens of thousands. His popularity among the people increased as he used his position to get real changes enacted for their protection. While based in Padua, he observed the crushing power of debt upon the common people. At Anthony’s insistence, the local municipality enacted a law protecting those who could not pay their debts that is still enforced today. 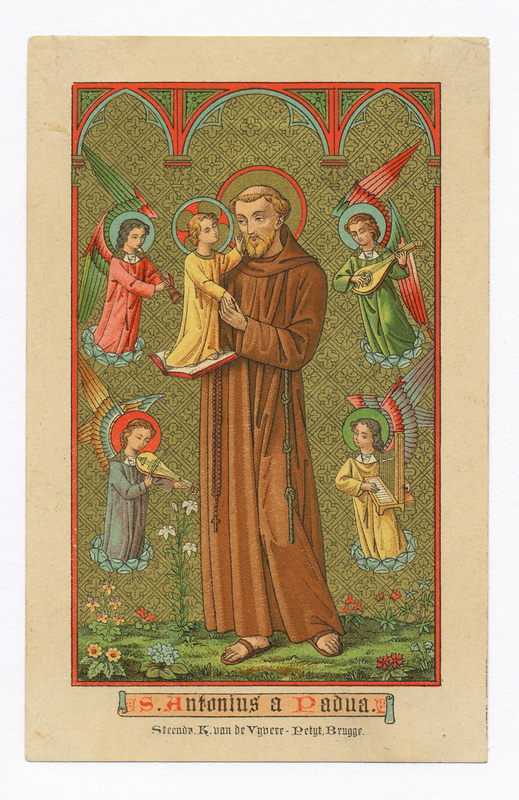 Holy Saint Anthony, gentle and powerful in your help, Your love for God and charity for His creatures, made you worthy when on earth, to possess miraculous powers. Miracles waited on your word, which you were always ready to request for those in trouble or anxiety. Encouraged by this thought, I implore you to obtain for me (mention your request here). The answer to my prayer may require a miracle. Even so, you are the saint of miracles. Gentle and loving Saint Anthony, whose heart is ever full of human sympathy, take my petition to the Infant Savior for whom you have such a great love, and the gratitude of my heart will be ever yours. “Saint Anthony, please come around, there’s something lost that must be found.” Doctor of the Church Feast Day: June 13 Patron of: Lisbon, Portugal, Padua, amputees, barren women, domestic animals, draftees, oppressed people, orphans, paupers, the poor, pregnant women, prisoners, sailors Invoked for: finding a husband, finding lost articles Invoked against: debt, shipwreck, starvation Symbols: baby Jesus, book of Gospels, lily Wonder and miracles are infused with every story of Saint Anthony. Though he has been dead for almost 800 years, he is still the most popular saint in the world and his statue is found in every Catholic Church. Saint Anthony is best known as the patron saint of lost articles but he is invoked for help in all life situations. In his own day he was called the “Wonder Worker’ and credited with the ability to stop the rain, raise the dead and reattach severed limbs. He was such a charismatic preacher that when a crowd of heretics in Rimini refused to listen to his preaching, the fish raised themselves out of the water to hear him. Born Fernando de Bulhes in Lisbon, Portugal, he disappointed his noble family by rejecting his luxurious life and joining the Augustinian religious order. A scholar by nature, he read every book in the monastery, devoting his time to contemplative prayer. Eventually, he befriended a group of itinerant Franciscan monks and became fascinated with this new religious order. Much impressed by their dedication to simplicity, poverty and their belief in returning to the original words of Christ, he joined their ranks, changing his name to Anthony in honor of Saint Anthony of the Desert, the patron of their little church. Returning home from a failed missionary venture in Morocco, his ship was blown off course and he wound up in Messina, Sicily. A group of Franciscan friars insisted he go north with them for a great gathering of all Franciscans, with their founder Francis of Assisi. Anthony remained in Italy and discovered his great gift of preaching when a superior ordered him to speak at an ordination, telling him to say whatever the holy spirit had infused into him. He astonished his audience, not only by his skills as an orator but by the depth of his knowledge. He was sent throughout northern Italy and southern France on evangelical preaching missions which gathered crowds in the tens of thousands. His popularity among the people increased as he used his position to get real changes enacted for their protection. While based in Padua, he observed the crushing power of debt upon the common people. At Anthony’s insistence, the local municipality enacted a law protecting those who could not pay their debts that is still enforced today. Anthony exhausted himself preaching out in fields and in piazzas as there was not cathedral large enough to hold all who came to hear him. At the age of thirty six, his health began to fail him and a local Count donated a woodland retreat for his recovery. One morning the Count heard the sounds of a baby giggling and he looked out to see Anthony surrounded in light, playing with the baby Jesus. That Christ would choose to appear to one of his saints in such a vulnerable state is a testament to the loving and kind nature of Saint Anthony. Because he is depicted holding a baby, women having trouble conceiving invoke his aid. Being of Portuguese descent, Anthony’s feast day is very auspicious for marriages in Portugal and Brazil and in those cultures, he is known to assist women seeking a husband. According to legend, Saint Anthony earned the title patron saint of lost articles when a novice borrowed his psalter and failed to return it. Saint Anthony prayed to get it back and the novice was visited by terrifying visions that sent him running back to Anthony with the book. In iconography, Anthony always holds the baby Jesus and a lily for purity. Many times the returned book of the gospels is included. Novena to Saint Anthony of Padua Holy Saint Anthony, gentle and powerful in your help, Your love for God and charity for His creatures, made you worthy when on earth, to possess miraculous powers. Miracles waited on your word, which you were always ready to request for those in trouble or anxiety. Encouraged by this thought, I implore you to obtain for me (mention your request here). The answer to my prayer may require a miracle. Even so, you are the saint of miracles. Gentle and loving Saint Anthony, whose heart is ever full of human sympathy, take my petition to the Infant Savior for whom you have such a great love, and the gratitude of my heart will be ever yours. Amen It is customary to donate to Saint Anthony’s Bread, a charity started in Saint Anthony’s lifetime, in gratitude to answered novena prayers.